I couldn't resist any longer and this year I signed up for the Loose feather club. I was happy to receive the first chart and just like a kid I was eager to discover the bonus. I stitched the pinkeeper with "Belle soie" on a 40 count linen. I didn't leave the cardboard under the peacock so I can pin needles on the top also. 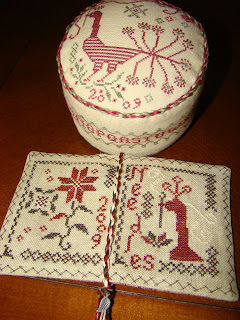 I didn't change anything for the needle book and followed the instructions given, except for the initial that I did not stich. I love the result and am raring to get the next one. I hope you understood my English as I am not so fluent. This is go cute! I think you did a wonderful jot. I just got this pattern, and you are inspiring me to work on it. I love it, it looks gorgeous. It is realy gorgeous! I love it!